Can I Kill Myself With Nectopotence? Can you pay 2 life if your health is at 1? 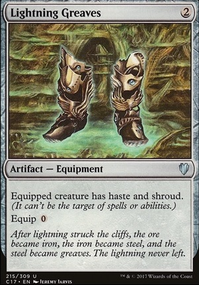 Definitely the two copies of Oblivion Sower and also either Platinum Angel s or one of your walkers. 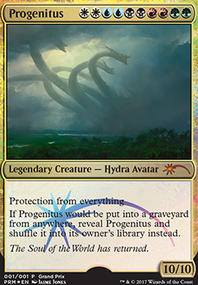 You have plenty of other, larger threats and by the time you get to 6-8 mana you're already at 10 for Ulamog. I dunno if Rayenous will make it viewable or even has the list still so I would start by looking over the following stolen from that forum and build from there. KrazyCaley said "Rayenous has it. There are multiple ways to do it, but they all involve variations on the same basic pattern. Step 1 - Mindslaver + Academy Ruins lock. Step 2 - Prevent your opponent and preferably also yourself from losing (since this procedure will take a long time) through the use of Platinum Angel or Abyssal Persecutor . Step 3 - Donate a mechanism to your opponent whereby they can put cards they own into their deck. 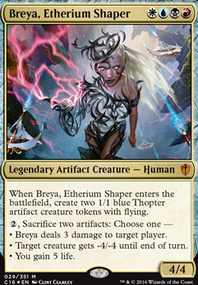 Rayenous used Research on an Isochron Scepter . My version of this deck used Death Wish (which works since our opponent can't lose the game while we have the Angel/Persecutor out), but Research is faster. Repeatedly have them add in cards until their entire collection is in the deck. 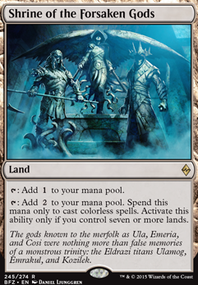 Note that you will probably also need to Donate something that generates any color mana to your opponent as well. Step 4 - Use Amulet of Quoz to convert their entire deck, which is now their entire collection, into their ante (true, we'd have to be playing with ante rules, which are now gone, but hey, that's the fun). Step 5 - Blow up whatever thing you set up to prevent your opponent from losing. Step 6 - Enjoy all your friend's Magic cards." Now I don't foresee anyone agreeing to ante so you might leave that part out... Also a lot of people even in casual games will say that only a side board can be added in with wish cards and commander doesn't use a side board. So most people play with the idea that if you use wish cards you need to let them know ahead of time. At this point I would be looking at a commander. Maybe? 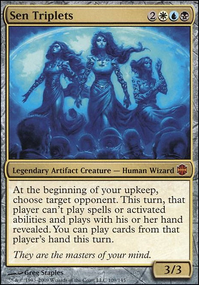 Could add in another color if you want... Parhaps use Lazav, Dimir Mastermind and mill their crazy sized library to the grave? 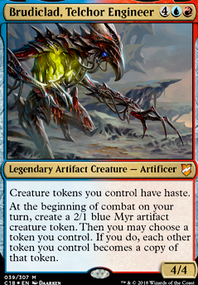 Actually a better option might be The Mimeoplasm for the commander. Cards like Villainous Wealth would be great. 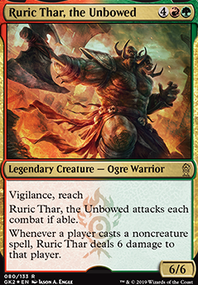 What do you think of including Sunforger to the deck? What would you replace from the deck? It works well with most of the instant cards and also you can rotate them with Mistveil Plains . 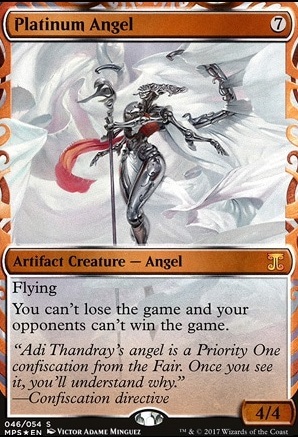 I was thinking maybe replaceing Platinum Angel since it seems like you don't need that extra protection. But then again I haven't played test the deck yet. FenrisBurgess, that is very valid criticism. My playgroup is not consistent in power level, so even though this list is not optimized with tutors to grab all the answers, Narset still becomes Archenemy (turn 3 Anointed Procession + Storm Herd off the top one time will do that haha). I have tried to keep the density of tutors that directly find me win conditions down. I like digging through my deck to find the River's Rebuke answer to my opponent's copies of Platinum Angel under Daretti. Recently though I have moved and have not played as much, so maybe it is time to get to an LGS and consider Enlightened Tutor and similar depending on the meta. They could make the deck significantly more focused, though I'd have to stare at this for awhile to figure out what to cut. Thanks for the feedback and upvote!